Just how rapid is the current rate of warming of the ocean? There is an interesting new article by Rosenthal and collaborators in the latest issue of the journal Science entitled "Pacific Ocean Heat Content During the Past 10,000 Years" that attempts to address this question. The article compares current rates of ocean warming with long-term paleoclimatic evidence from ocean sediments. So how rapid is the ocean warming? Well, for the Pacific ocean at least, faster than any other time in at least the past 10,000 years. The study finds, specifically, that (to quote Columbia University's press release) the "middle depths [of the Pacific Ocean] have warmed 15 times faster in the last 60 years than they did during apparent natural warming cycles in the previous 10,000". Beyond that key overall take-home conclusion, though, there are some enigmatic aspects of the study. The authors argue for substantial differences between proxy reconstructions of surface temperature and their new sediment core evidence of intermediate water temperatures from the tropical IndoPacific, during the past two millenia. The researchers argue that recent warmth is anomalous in the former case, but not the latter. They argue that, while the present rate of ocean warming is unprecedented, the actual level of ocean heat content (which depends not just on surface temperature, but also sub-surface ocean temperatures) is not as high as during Medieval times, i.e. during what they term the "Medieval Warm Period" (this is a somewhat outdated term; The term "Medieval Climate Anomaly" is generally favored by climate scientists because of the regionally variable pattern of surface temperatures changes in past centuries--more on this later). One complication with their comparison is that the dramatic warming of the past half century is not evident in the various sediment data analyzed in the study. "Modern" conditions are typically defined by the "tops" of the sediment core obtained by drilling down below the ocean bottom. But sediment core tops are notoriously bad estimates of "current" climate conditions because of various factors, including the limited temporal resolution owing to slow sediment deposition rates, and processes that mix and smear information at the top of the core. Core tops for these reasons tend not to record the most recent climate changes. Thus, the researchers' data do not explicitly resolve the large recent increases in temperature (and heat content). But if the warming of the past half century is not resolved by their data, then the assumption that those data can be registered against a common modern baseline (the authors use a reference period of 1965-1970) too is suspect. That registration is critical to their conclusion that modern heat content has not exceeded the bounds of the past two millennia. There are also some puzzling inconsistencies between the authors' current conclusions and other previously published evidence implying a very different pattern of global ocean heat content changes over the past two millennia. Current global sea level has been shown to be unprecedented for at least the past two millennia in previous work using both proxy-based sea level reconstructions and predictions from "semi-empirical" models of sea level change. Thermal expansion due to sub-surface ocean warming is a substantial contributor to the observed rise this century in global sea level. It is thus difficult to reconcile the observation that modern sea level is unprecedented over at least the past two millennia with the authors' claim that there has not been an anomalous increase in global ocean heat content over this time frame. Given that there is unlikely to have been any sea level rise contribution from melting ice sheets prior to the most recent decades, any explanation would have to involve extremely large sea level contributions from the melting of small glaciers and ice caps, contributions that exceed what is actually evident in the climate record. Finally, we need to maintain a healthy skepticism about broad conclusions about global climate drawn from one specific region like the tropical IndoPacific. It is surprising in this context that the article didn't mention or cite two studies published in the same journal (Science), a few years ago: Mann et al (2009) and Trouet et al (2009) which demonstrate a high degree of regional heterogeneity in global temperature changes over the past millennium. Both studies attribute much of that heterogeneity to dynamical climate responses related to the El Niño phenomenon. The tropical Pacific appears to have been in an anomalous La Niña-like state during the Medieval era. During such a state, which is the flip-side of El Niño, much of the tropical Pacific (the eastern and central tropical Pacific) is unusually cold. But the tropical western Pacific and IndoPacific are especially warm. That makes it perilous to draw inferences about global-scale warmth from this region (see this more detailed discussion at RealClimate). There a few other minor, odd things about the study. In a figure comparing the sediment records with proxy reconstructions of surface temperature, the authors attribute one of the curves to "Mann 2003" in the figure legend. This would appear to be a reference to a rather old reconstruction by Mann and Jones (2003), which is supplanted by a newer, far more comprehensive study by Mann et al (2008). The authors indeed cite this latter study in footnote of the figure caption. So it is unclear which reconstruction is actually being shown, and the comparison is potentially inappropriate. 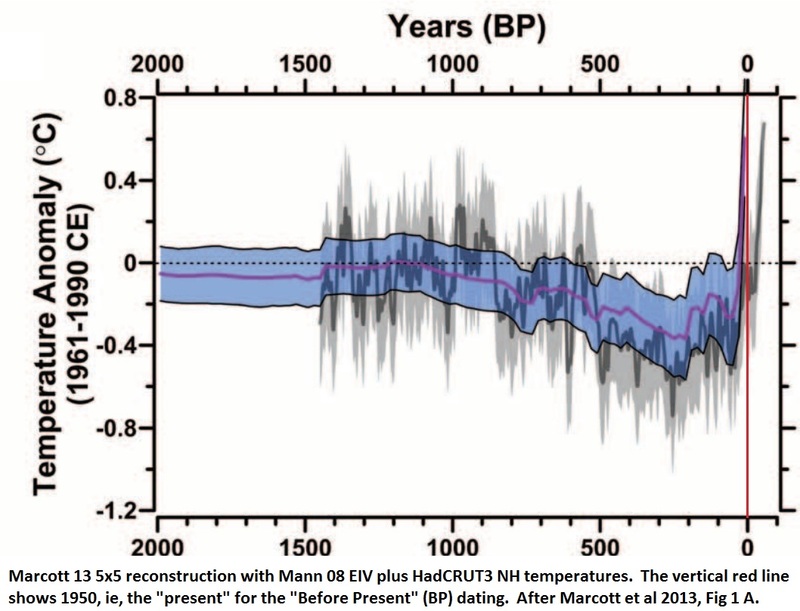 The authors, in a different figure, show a recent, longer albeit somewhat more tenuous reconstruction of global temperature over the past 11,000 years by Marcott et al (2013), published in Science earlier this year. That reconstruction was observed to be consistent with that of Mann et al (2008) during the interval of overlap of the past two millennia. It is also puzzling that the article doesn't show or even cite the most comprehensive hemispheric reconstruction to date, that of the PAGES 2K consortium published in the journal Nature Geoscience two months before the present paper was submitted to Science. That reconstruction demonstrates modern warming to considerably exceed the peak warmth of the Medieval period, closely resembling the original Mann et al "Hockey Stick". It would have been useful to see all of these reconstructions, each of which demonstrate recent warmth to be anomalous in a long-term context, compared on the same graph against the sediment series of this study. In summary, the Rosenthal study is interesting and it provides useful new paleoclimate data that give us an incrementally richer understanding of the details of climate changes in pre-historic times. However, there are a number of inconsistencies with other evidence, and debatable assumptions and interpretations, which will require sorting out by the scientific community. That is, of course, the "self-correcting" machinery of science that Carl Sagan spoke so eloquently of.